Following on from my recent alkaline extraction method experiments, I decided to try the method used by Krista Vajanto in her dissertation and described in my post of March 8th. So before adding a further set of samples, I left the dye baths to become acidic. This proved more difficult than I had expected, as the pH decreased a little and then remained stubbornly at around pH9 and refused to become more acidic. After a couple of weeks, I decided to add another set of samples anyway, which I left to steep for about 4 weeks. The dye baths looked very strongly coloured and I was hoping for well-dyed samples. Indeed, on removal from the dye baths the samples appeared deep in colour but most of the colour washed off, leaving the samples considerably paler than the first set, which had been in the alkaline dye bath for only 2 weeks. I really don’t know how to interpret these surprising results. If the dye baths had been pH7 or below, I would have assumed that the acidic conditions had made the samples paler. This would have been in line with results from acidic modifiers which often result in the samples becoming paler. But in this case the dye baths were still alkaline, although less so than for the first samples. However, the dye baths had become slimy and viscous and I wonder if this is a sign that fermentation was taking place and the fermentation caused the colours to become paler? This photo shows, from the top: birch bark, alder bark, white willow bark, tormentil root, with 4 samples for each. For each dye, the pair of samples on the left is from the first dye bath (2 weeks) and the pair on the right is from the second dye bath (4 weeks). In each pair, the top sample is alum-mordanted and the lower sample is unmordanted. 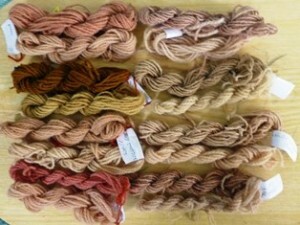 The photo quite clearly shows how much paler the samples are from the second dye bath. Very puzzling!